Cotterill went back to his old club Cheltenham Town to sign Duff for £30,000 in the summer of 2004, and the rest is history. Duff has since racked up over 350 appearances for Burnley, winning two promotions to the Premier League. And after he was granted a testimonial for his services at Turf Moor, a proud Cotterill, who was also his boss at Whaddon Road, said: “I think there were a few inspired signings who ended up doing really well for Burnley Football Club, but Duffo is certainly one of them. “I knew him from such a young age, 15 or 16, and it was really important he ended up doing well, because I didn’t want it to look like I brought him in just because I liked him. But he’s had an unbelievable career, and it’s testimony to him. Cotterill described him as a “calculated risk” and he explained: “I thought it was a big jump at the time, but, all credit to him, he’s been brilliant. 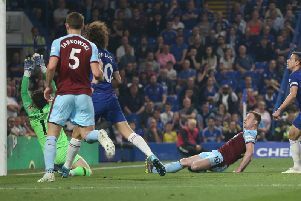 “He’s been arguably one of Burnley’s best-ever signings for what he cost and what he’s achieved. “He’s a great lad, a fantastic professional, and he’s got better as he’s got older. “He’s played at every level possible - from the Southern League Midland Division, to the Southern League, the Conference, League 1 and 2, the Championship, Premier League and he’s a full international. “If you’d told him when he was 15 or 16 and on loan at Cirencester in the Midland Division, he would have the career he’s had, he would probably have never believed it. “But you give plenty of opportunities to people, and it is up to them whether they take them. He has with both hands and it couldn’t happen to a nicer lad.